With protein powders everywhere these days, it’s easy to get drawn in to the flashy labels. Unfortunately, most protein powders are not as great as they seem! Just because it says organic and natural, doesn’t mean anything. Moms- mom’s are some of the busiest people and sometimes finding time to sit down and eat is hard. Be able to get quick protein on the go, is such a huge plus for moms. *The reason there is heavy metals in plant based proteins is because whatever is in the soil gets soaked up. So if the soil contains a lot of heavy metals, then the plant is soaking that up. If you take pea protein for instance you essentially are eating 100’s of peas each time you’re taking your pea protein, so you want to make sure the the quality of the peas is good. Overtime that could add up to a lot of heavy metals if you’re not careful. Proteins are often cheaper because they skimp on quality ingredients and sourcing. It can still be hard to find a clean protein at your local health store or Whole Foods. Best thing to do is e-mail/call them and ask questions about their protein. Helps to decrease cortisol after workout. Helps to spike hormones in a good way after workout. 15 grams of protein is great after workout. Whey collects air and the more powerful your blender the more air is collected. The air can cause you to feel bloated, have gas, and make you feel like the protein is just sitting in your stomach. Just add the protein in after you’ve blended all the ingredients. If you still feel bloated, gassy or like a ball is sitting in your stomach you may just have a bad protein. If you add some rice and pea protein together you will get more of a complete protein since they both are missing certain amino acids. What protein do we recommend? It is really light and doesn’t ever make you feel bloated. That’s because there is nothing added to fill up space, just the purest goat whey and flavoring. 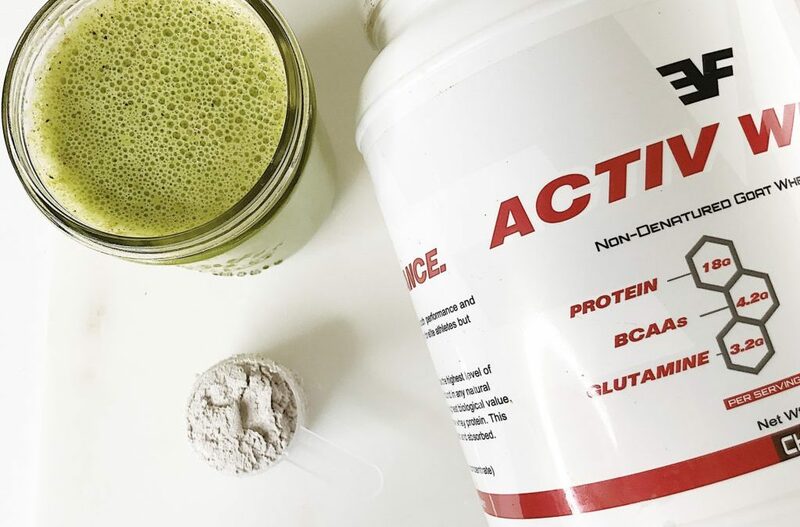 You can find Activ Whey at EliteFuel.net. What has your experience been with protein powders?